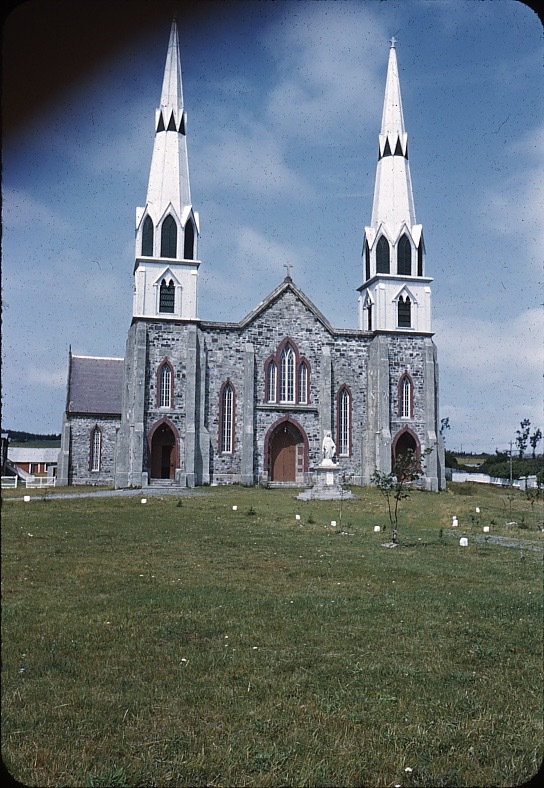 ICH Blog: The Cathedral of the Immaculate Conception, Harbour Grace, circa 1949-1951. The Cathedral of the Immaculate Conception, Harbour Grace, circa 1949-1951. We have a gem of a historic photograph for Tuesday's Folklore Photo this week! The Heritage Foundation of NL has been working with a committee in Harbour Grace to find a new life for the Cathedral of the Immaculate Conception (read about that here) and it has unearthed this great photo of the building, taken sometime between 1949 and 1951. I’m guessing that he played some role in decommissioning the signal intelligence facility that was located at Harbour Grace – perhaps for reinstallation at Ft McAndrews, but it’s pure speculation. He was stationed at Ft McAndrew AFB in Argentia from 1949 through 1951 (where I was born). He was a Signal Officer. From his orders: “Commanding Officer of Signal Company Aviation responsible for training, administration, supply, personnel.” Responsibilities included “supervising installation, maintenance, operation of telephone, telegraph, and radio equipment.” I don’t think he was in Harbour Grace on vacation – not to dismiss it as a cold war period USAF personnel vacation destination, but his service record shows he had 58 days of unused vacation when he concluded service in Newfoundland, so he probably wasn’t taking much time off. If you have any old photos of the Cathedral (or a memory of Captain William Brooks) email me at ich@heritagefoundation.ca. Read more about the Cathedral itself here.